I’m failing in my attempt to write a poem a day. It all happened when my spring break started. In truth, I’ve only been off one day, but without my schedule and my students, I feel uninspired. We crave this kind of time, a wide open day to write, and when that time happens, nothing. Blank page. I have no choice but to give my brain this break it wants. I’ll take a walk and perhaps a muse will come. If I’ve learned anything about being a writer, it is this: writing happens in its own time. This weekend my husband and I attended a wedding for a friend’s son. We enjoyed relaxing and not being in charge of anything. During the ceremony, the priest read a Rumi poem and talked about how this couple was crossing the threshold to a new world, a world that they would live in together. I started thinking about how our world has changed, how change is inevitable, how change is the only constant. Within the last 6 months, two of my daughters have gotten married. Their worlds have changed. My day to day hasn’t changed, but as I look forward to the Easter holiday this weekend, I realize that our family is larger now. We have two sons as well as three daughters. In so many ways this new world is wonderful, and it will continue to grow and change. I accept this new world. I embrace the memories of each gathering. Michelle, I think we were simultaneously reading each other’s blogs. I love it when that happens. Thanks for your words of encouragement. Ah yes. Life! There is so much waiting, how can we not open the door. As always, glad to read your words and see the images you create. I hear that you think you don’t have a poem, but it feels to me like this post is one. 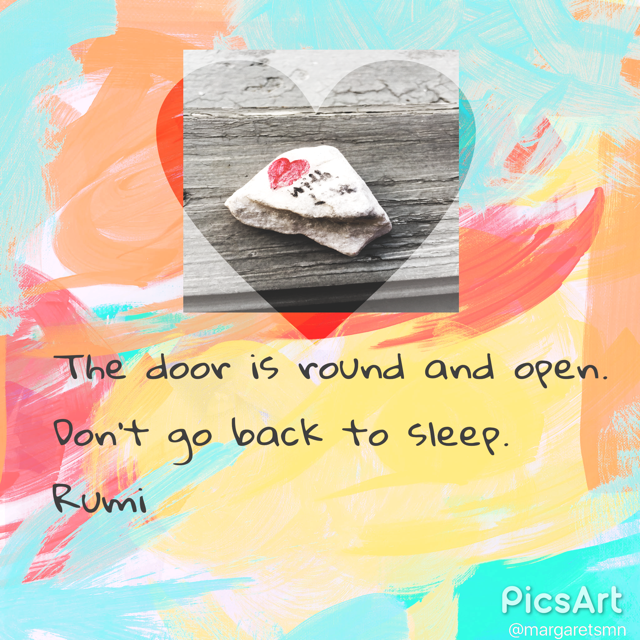 The Rumi poem, like many, is wise, isn’t it? Thanks for creating that one line into a lovely image. Enjoy your break, wherever it takes you. . . I was playing with a new app, PicsArt. Using Rumi’s words helped me just have fun with it. Thanks for your encouragement. Will look for that app. Fun to have a new one! Maybe your muse is telling you it needs some time off. Your heart seems so full right now of the significant changes in your own life…changes that need time for you to process. And that is exactly what you did with us today…process…and in that processing you created a beautiful Slice, complete with a poetry sharing and a small inspirational poem of your own. I am grateful for your thoughts and images today because I, too, am going through a major period of processing the changes in my life. And now I know I’m in good company. I wrote about change today, too. It’s interesting how change, expected or unexpected, affects us in different ways. And I think you were successful in creating a poem today. Thanks also for sharing your process of reflection. You have a new world to navigate by welcoming in two young men who love your daughters. Your words will come as you listen and observe life around you. I love this inspiration you shared. I am trying to keep the door open. Change can be good. When you stop and think how much you have written in the last month and a half, you deserve a break. I wanted so badly to write more poetry this month, but it just hasn’t happened. I love your image – ahh…another app to explore! This is wonderful, Margaret. I, too, have not written a poem each day but as you said, the muse may inspire along the way. Breaks are meant for exploration and release to find the peace. And the heart art you parked with it is lovely. brings more love into your heart circle.